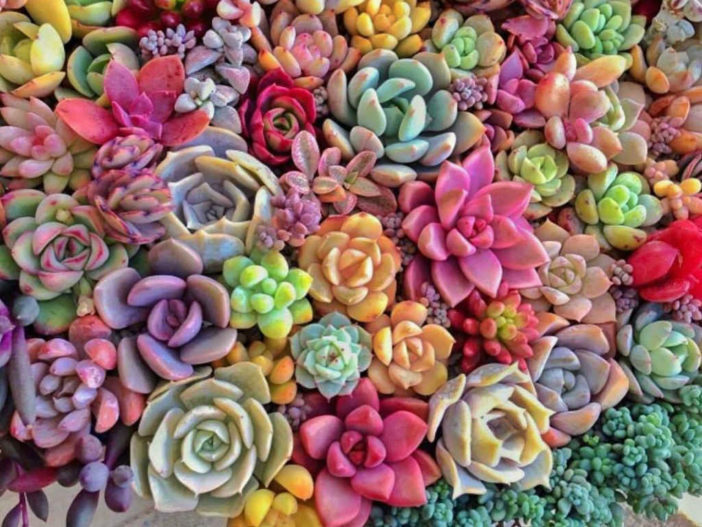 You are at:Home»Cultivation»Why and How do Succulents Change Color? Why and How do Succulents Change Color? Succulents can change colors throughout the year based on multiple factors such as water, length of day, heat, fertilizer, soil etc. Like other plants, they absorb water and carbon dioxide and transform them into glucose and oxygen through photosynthesis. In this process, pigments called chlorophyll (shows the color green), carotenoid (shows the color of yellow to orange) and anthocyanins (shows the color red or purple) play an important role. When put in the shade, most succulents turns green because chlorophyll is responsible for capturing sun light to keep the photosynthesis process going. When placed in the sun or extreme temperatures, the anthocyanins are in higher concentration in the plant cells. The anthocyanins act as antioxidants protects plants against overexposure to UV lights and extreme temperatures. It is also known that anthocyanins which are more stable in lower temperature. That is why we often see succulents green in summer and color up during fall and winter. Similarly to other plants, when put in the shade, succulents also tend to grow longer stems, and the leaves are more spread-out. That is simply because all plants want to get more exposure to the sunlight by making themselves wider and closer to the sun. Overwatered succulents tend to grow leggy stems and spread-out leaves. So, it is critical to resist the temptation to water your plant too often is the most efficient way to maintain its size and rosette shape. Also, many people wonder why their succulents’ leaves are so thin and long and so different from plants grown by “experts”. That is because when you over water, your plant tends to grow larger and stretched out while experts water less and their plants had to store water in their leaves. That is why leaves are fatter and juicier with less water. Not enough sunlight can make your succulents look green and leggy, yet too much sunlight can also cause sun damage. As you increase its sun exposure, anthocyanins are in higher concentration to protect the plant from sun damage. However, if your local UV rating is too high, you can also protect your plant with a layer of shade cloth with less than 50% UV block. Alternatively, put the plant in a spot with morning sun and afternoon shade. Temperature usually goes hand in hand with sunlight. With extreme temperatures, over 90°F (32°C) and below 32°F (0°C) in most cases, plants can go dormant to adapt the environment. As they go dormant in summer, the growth slows down dramatically, and leaves turn into vibrant colors. Also, most rosette succulents close their leaves to a ball shape to reduce evaporation. In winter where some succulents die back or lose some of their leaves to protect the root system, some will close up and change color such as Sempervivums to protect themselves from the cold winter (darker color attracts heat). If they survive, they will put out new growth when the temperature warms up. Fertilization usually is not that big of a concern as most succulent can do well with little to no fertilizer added. Most succulents will do best when fertilized using water soluble fertilizer once every 2 months to encourage growth. The plants may put out new growth and turns green for a while, but quickly turn back to vibrant color with enough exposure to sunlight.